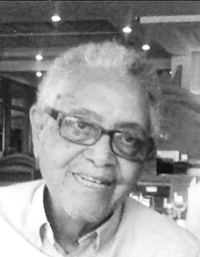 Augustus Funeral Home regrets to announce the passing of Mr. Harold Francis James ‘Frankie’ Smith. A Home Going service for Mr. Harold Francis James ‘Frankie’ Smith, beloved husband to the late Phyllis Smith nee Ingham, son of the late Aubrey and Beulah Smith [nee Mears], loving father to Glen Ingham, Colin ‘Blondie’ Smith and Buddy Collins, brother to the late Hubert Smith Sr., Aubrey Smith, Thomas “Tommy” Smith, Harry Smith, Dorothy Bean, Elsie Butterfield, Evelyn Lespere, Mary Cann, in his 94th year of 11 Inland Lane, Cox’s Hill, Pembroke will be held at St. John’s Church, Pembroke Today, September 10, 2018 at 2:00 pm. Relatives and friends may pay their last respects at Augustus Funeral Home Today, September 10, 2018 from 1:00 pm – 1:45 pm. Lovingly remembered by grandchildren: Clayton Collins, Crystal DeSilva, Sanjay DeSilva, Joshua DeSilva, Riley Collins; great-grandchildren: Cruz DeSilva, Emily and Lillith Collins; daughter-in-law: Jackie Collins; brother-in-law: Jerard Lespere, Arnold Cann; sisters-in-law: Frederica Smith [living], Isoria “Mary” Smith, Gladys Smith; special friend: Patricia Quinn; special daughter: Irene DeSilva [mother to Colin’s children]. Harold Smith was predeceased by sister-in-law: Marilyn Smith; brothers-in-law: Kenneth Bean, Joseph Butterfield.